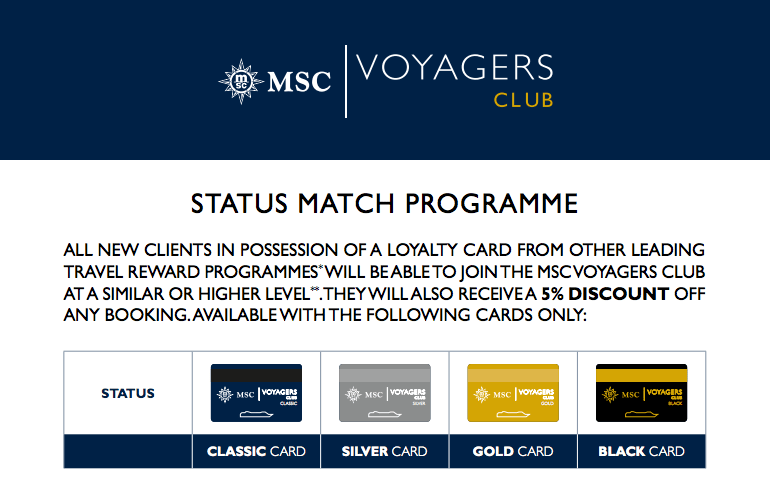 Voyagers club is MSC loyalty status, similar to NCL’s latitudes program and Royal Caribbeans Crown and Anchor scheme. It provides you with benefits which increase the more than you cruise with MSC. During your first cruise, you have a welcome membership, you’ll then progress onto classic, silver, gold and black. Skip straight to black benefits! MSC does this really cool thing where you can match a status from another cruise line. I have platinum latitudes status on NCL so was able to match this to MSC’s black. 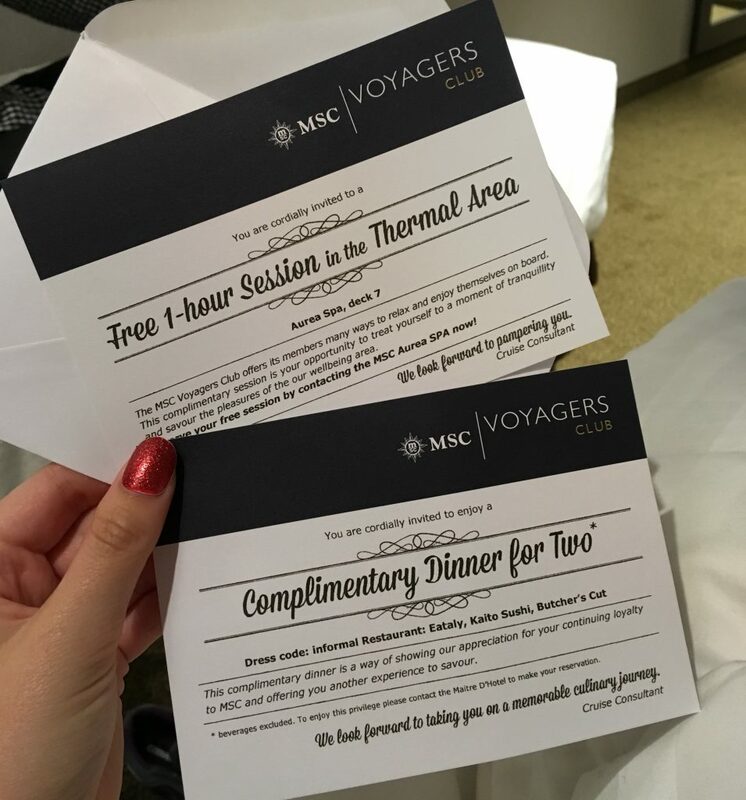 This meant that I had all of the perks even though I had only been on one MSC cruise before! The benefits are brilliant so this is well worth doing. I have a separate post about how to match your status here: MSC’s status match. It is really easy to do, you just need to fill in a form and provide proof of your loyalty status. When do you get the benefits? This one is a little strange. I expected to have all of the benefits waiting for me in my cabin when I arrived but they showed up throughout the cruise. How they organise this I have no idea, must be a logistical nightmare. You receive a card which will tell you what each of the perks is. You don’t actually need the card to use the perks as the benefits are already on your cruise card, but we usually took these with us. Each black card entitles you to a meal for two at a speciality restaurant. I took my brother one evening and then he took me the day after. Before cruising I thought that this would be one meal for both of us, but we were able to eat out twice for free. 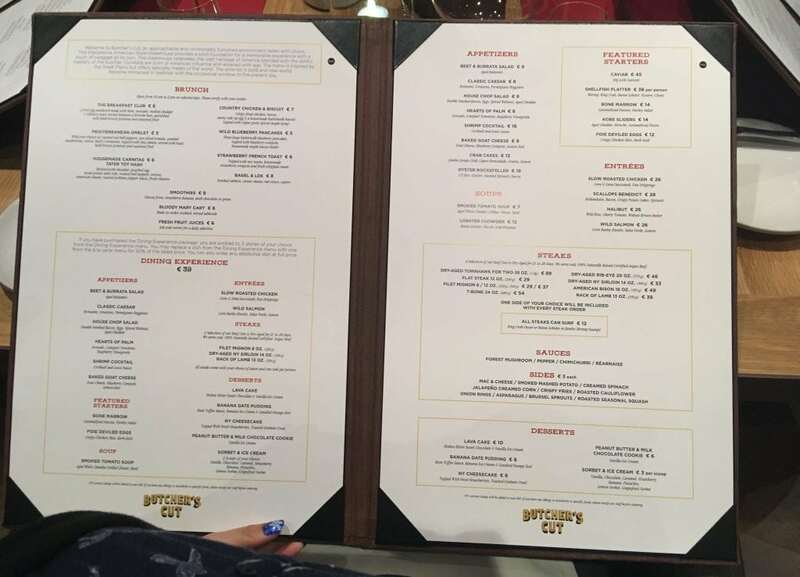 When eating in a speciality restaurant you may have to eat from a special menu as we did in butchers cut (tasting menu). 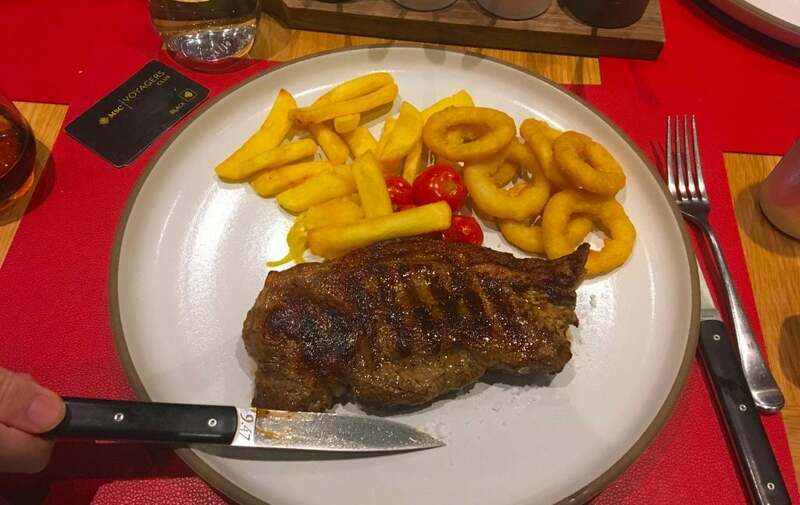 The value of the meal was €39! Click here for a full MSC food review. 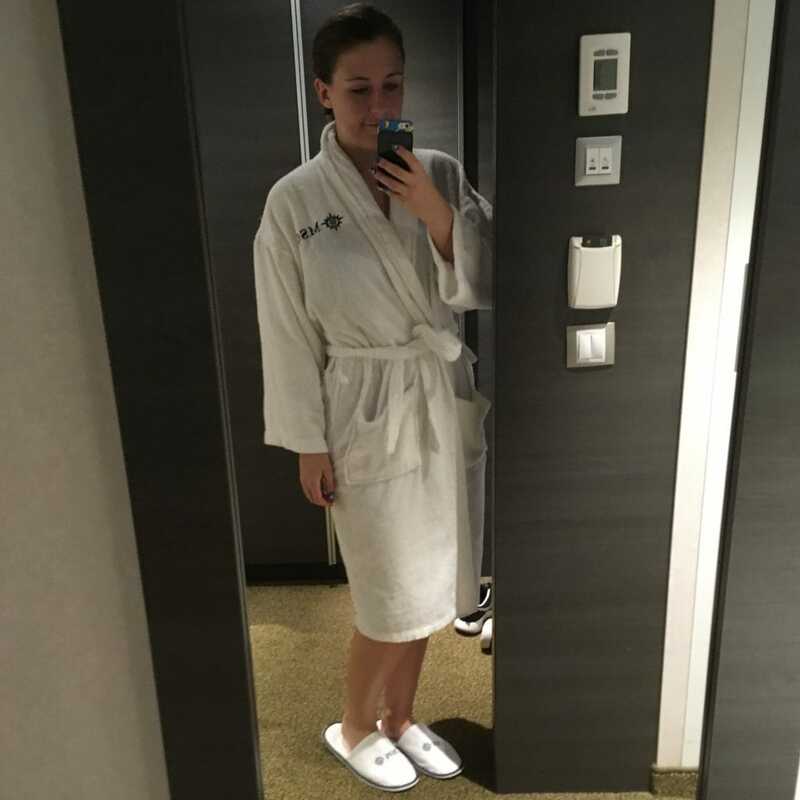 The MSC Meraviglia has a spa which you usually pay to use. I’ve never been in a spa on a cruise ship before because this isn’t really the type of thing that I would pay for. That said, I really enjoyed our hour in the spa! 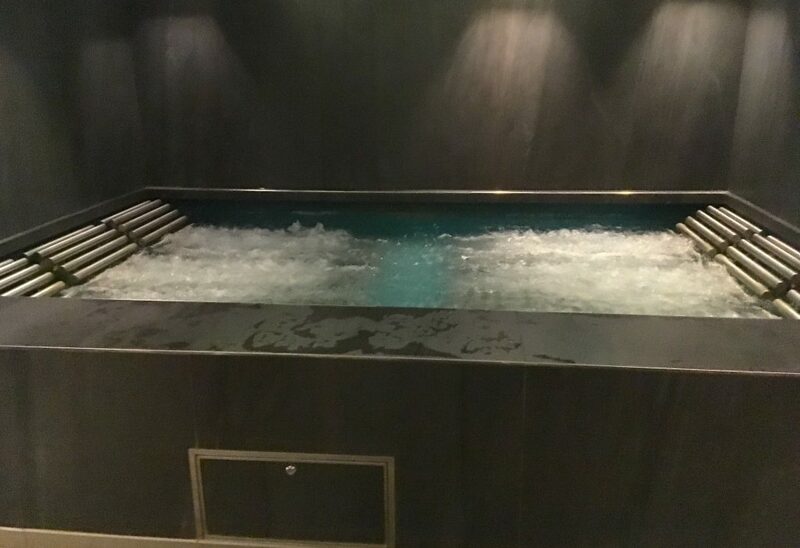 There were a number of steam rooms, saunas and big bubbly pools. I basically spent the hour running around making sure that I got to have a go at EVERYTHING! 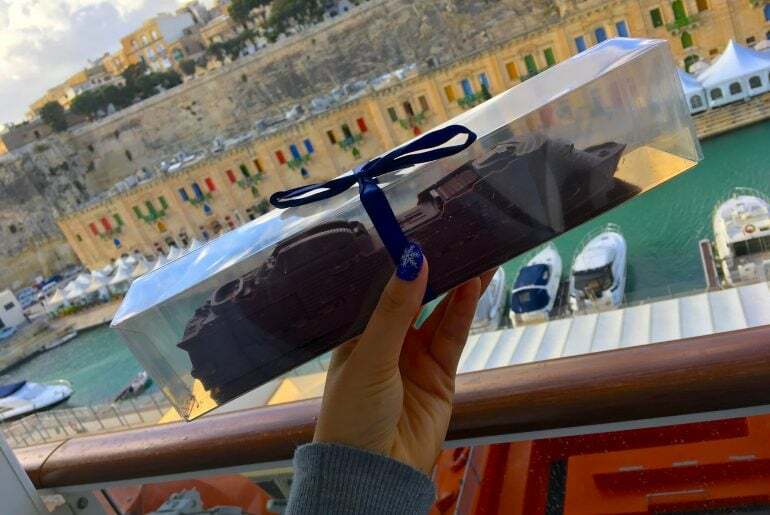 The chocolate ship showed up midway through our cruise. 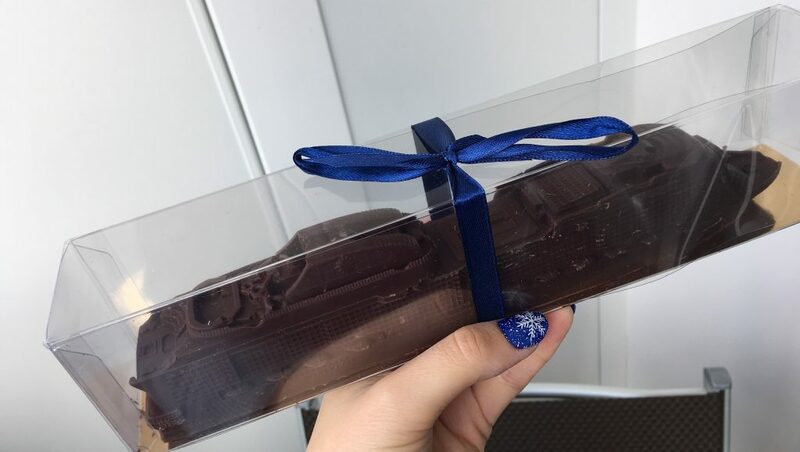 We’re actually still eating it now a month later… It is very clever and really does look like the Meraviglia. We saw them being made one morning when we walked through the chocolate shop. There were a number of other chocolate things dotted around which looked really impressive. 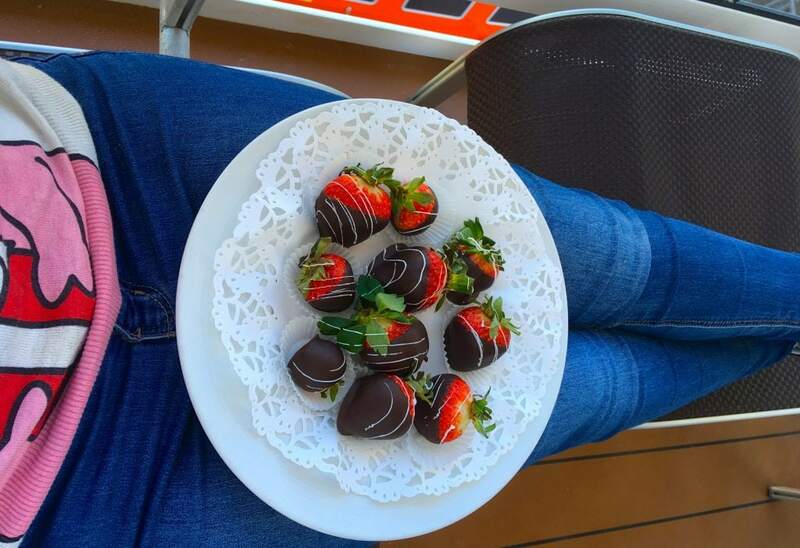 Who doesn’t love chocolate strawberries? I headed over to my parent’s balcony to enjoy these. 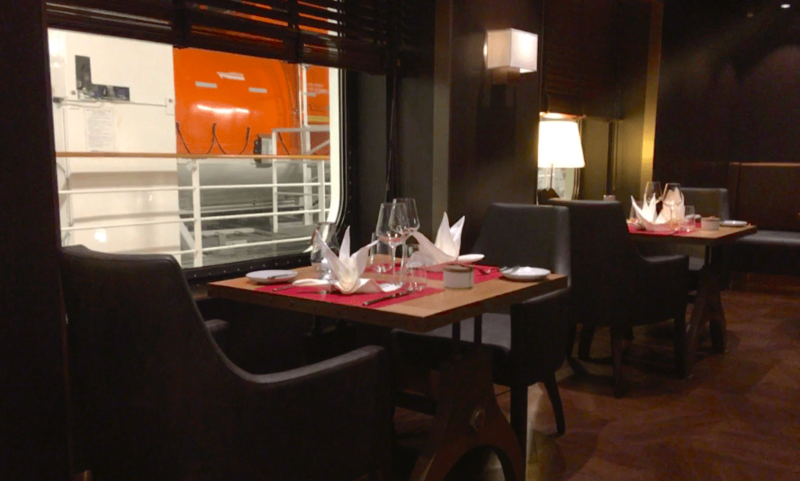 Although I do love an inside cabin, and really loved my cabin onboard the Meraviglia, you cannot beat sitting out on a balcony while eating something yummy! We disembarked the Meraviglia on new years eve so actually took our prosecco off the ship to enjoy at midnight. 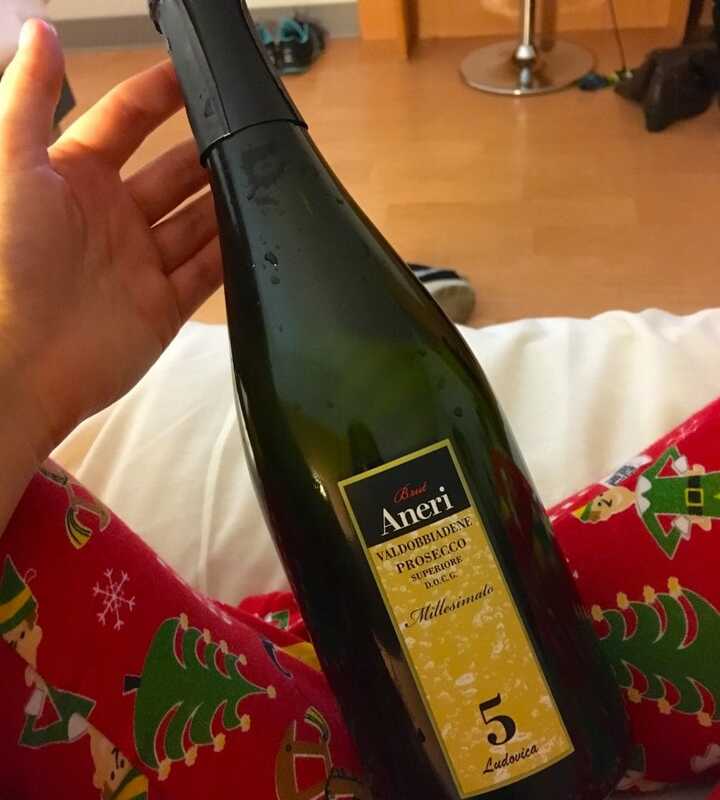 We stayed in Nice for the night and I enjoyed drinking the Prosecco in my elf pyjamas! I am a big fan of Processo and it tasted nice to me. We were given a free bag which I now use to take to the gym. I love cruise souvenirs and free ones are even better! This showed up towards the end of our cruise. We were given priority boarding when we went to embark in Genoa. However, the priority boarding line was longer than the regular line so it didn’t really make much difference. I appreciate the gesture though. I referred to the bathrobe as a ‘dressing gown’ in my inside cabin tour video. I didn’t realise that dressing gown wasn’t a worldwide phrase! Anyway, I enjoyed the slippers and bathrobe. Who wouldn’t? I’m afraid I didn’t attend this one! I was too busy doing other things, the Meraviglia is huge and it’s difficult to fit everything in. I loved the free meal and the free hour in the spa! I would definitely recommend matching your status if you have any kind of loyalty status on another line. It’s well worth doing. I love freebies and getting freebies when I just matched my status was even better. 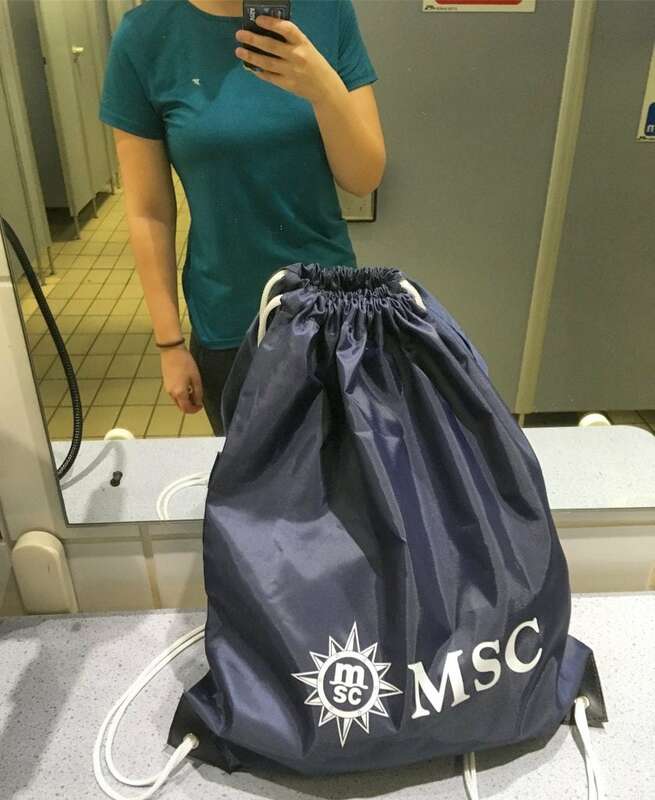 Have you ever cruised with MSC? Let me know in the comments! Yep! 🙂 Definitely worth it. 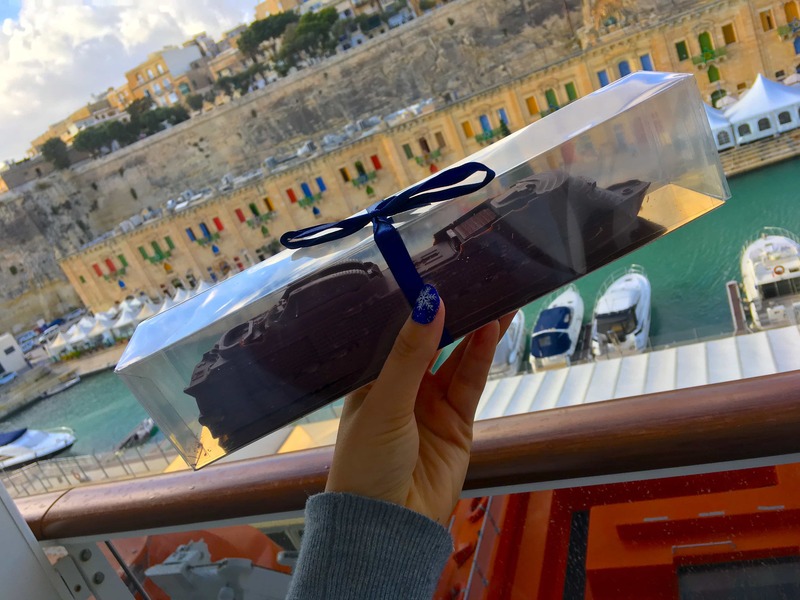 Though we love, love, love the perks you get with the Black Level status we do miss the Diamond (and above) Lounge + the free drinks onboard Royal Caribbean. Another annoying thing is they tend to forget the invitations to the events so you have to make sure to ask about them. How do they track, that you spend exactly 60 minutes in the spa and not more? What happens, if I stay a few minutes longer?